Using our HTML online test will allow you to easily assess the skills of prospective candidates before you invite them to a live interview. 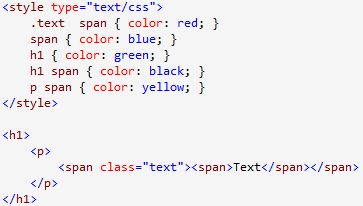 This HTML/CSS test has been developed by veteran front-end programmers with years of experience. It consists of 40 questions and covers a broad spectrum of HTML and CSS development knowledge. Your candidates' results on this test will provide an accurate picture of their HTML coding aptitude. What color will be applied to the text? The correct answer is "Red". 1. How did we create the test? Five highly skilled HTML/CSS developers worked together to develop questions for the test. Each of the developers has at least seven years experience in programming. We then selected the questions that most closely related to actual front-end development for inclusion in the test. Less than 30% of the questions submitted were selected for the final version of the HTML and CSS online test. 2. Is each candidate presented with the same questions on the test? Yes. All candidates are presented with the same questions. This ensures that candidates face the same level of difficulty in taking the knowledge test for maximum fairness. However, the specific order of questions and answers may vary from one test to another. 3. What is difficulty of the exam? We made this front end developer coding test primarily for mid-level programmers. You may allow junior developers to take the HTML test, but you should lower the acceptance score dramatically if doing so. Likewise, if you use the online test for evaluating senior developers, you should increase the acceptance score accordingly. While it is true that providing different tests for each skill level can be useful in evaluating developers, the test covers a sufficient range of material so that adjusting the acceptance score can provide a similar indication of competency. 4. How should the test scores be used in assessing job applicants? The purpose of the HTML online test is not to identify the most capable developer. It is to help you eliminate those least qualified. For example, assume that you have five candidates with the following HTML/CSS interview test scores: 35, 45, 60, 65, and 80, based on a maximum possible score of 100. In this case, we would recommend that you invite those with the three highest scores (60, 65, and 80) to interview, rather than simply selecting the top one with the score 80/100. This approach will eliminate those who demonstrated a lack of minimum skills, while allowing you enough qualified candidates to make a wise hiring decision. The most suitable candidate may not necessarily have the highest test score. You must consider many factors before making a final hiring decision, including experience, communications skills, work history, and so on. The HTML/CSS exam can be a valuable tool in helping you identify qualified candidates, but should be only one of the factors you use to make a hiring decision. The test is presented in a multiple-choice, or quiz, format, rather than requiring test takers to write code. We chose this format because we feel it is the fairest and most practical. There are many acceptable ways a candidate could write code in response to given problem. Evaluating each code sample would be neither objective nor practical. We are considering allowing customers to add their own custom questions in the future. Please let us know if you have any suggestions on how to make this feature useful to our customers.